1 Slice tofu into cubes and fry. Drain oil and set aside. 2 Slice bangus belly into the same size as the tofu, then fry. Drain oil and set aside. 3 Saute garlic, chopped onions, on a separate pan. 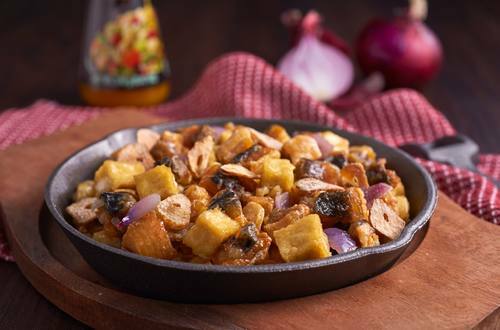 4 Add tofu and bangus belly into the pan, mix together and add Knorr SavorRich Pork Liquid Seasoning. 5 Continue to saute until tofu and bangus are thoroughly coated with seasoning and well cooked.